I think this is a great way to restart this blog that’s been lying in cold storage for almost a year. On Saturday, Jan 11th, 2014 I had a cracker of a storytelling session at the Rangoli Metro Art Center (R-MAC). First up, it’s a big honour to have performed there, right in the heart of Bangalore city and just below the purple metro line. The folks at R-MAC are doing a fabulous job of promoting the Boulevard as the city’s cultural hotspot. Get this: in one day there was a ‘Coffee Santhe’, a photography exhibition, storytelling sessions and poetry reading, all in the same stretch of Bangalore’s most famous, MG Road. Whether you’re an adult or child, you were spoilt for choice. The ambience was just what a storyteller wanted: people of all ages everywhere, lovely bright sunshine and the smell of fresh coffee. 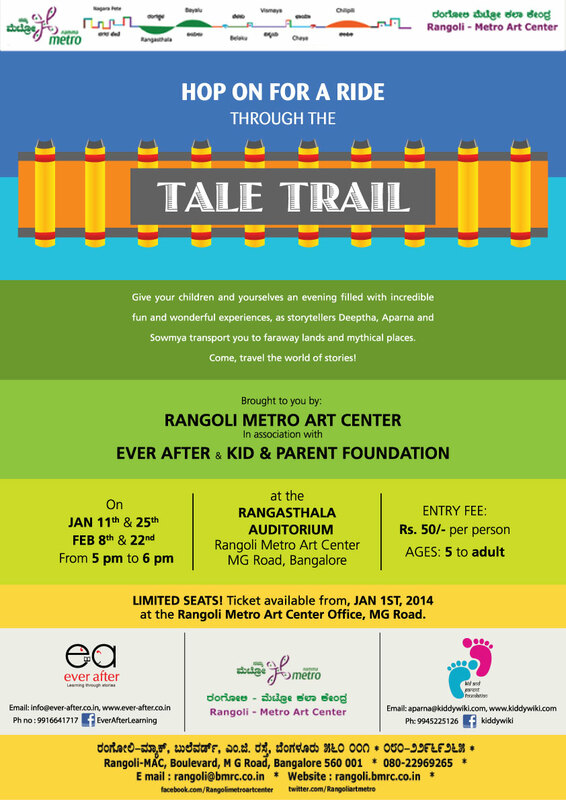 So, ‘Tale Trail’, a series of storytelling sessions that will be held at Rangoli, every second and fourth Saturday of Jan and Feb will feature unusual and unheard of folk-tales from around the world. It’s a humble attempt to educate and entertain people about the different cultures of the world through fascinating narratives. I have partnered with two other wonderful storytellers and my dear friends, Aparna and Sowmya from Kid and Parent Foundation to run this initiative. For the first session on Jan 11th, we decided to tell stories about trains and coffee, in keeping with the ‘Coffee Santhe’ theme and given the fact that we were performing at a train station. The show started with us playing the popular Karadi Tales song, ‘Train.‘ Once the audience was familiar with the beat, we had them sing another song—dedicated to Bangalore Metro—with the same tune but with altered lyrics that went something like this: “Metro Metro, Namma Metro; Stand behind the line yellow, the train is here and in we go…” Just a small but spirited way of showing our gratitude to the Bangalore Metro Rail Corporation for encouraging art and performers like us. The first two stories were about trains and journeys. Aparna and Sowmya do a fantastic job of tandem telling. This time they presented Calabash Cat, a West-African folktale that talks about a cat’s journey to find out where the world ends. Out came the puppets as A & S, invited kids onto the stage to help them tell the story. There was laughter and happiness all around as every child wanted to be up on stage. At one point, all the kids–and that’s about 20–formed a huge train and circled the stage in their quest to find where the world ends! Right after this, Aparna presented a quick segment on the first steam engine and some factoids on George Stephenson, the father of the first steam locomotive. Sowmya then narrated the legend of John Henry, a worker on the railroads. In a poignant story that captured his struggles as a steel-driver in the Chesapeake and Ohio Railway in the 1870s; he had to eventually give up his job to a steam powered machine that was capable of laying tracks faster than a human. It was a tale of his prowess with the hammer and his almost super-human strength that kept him going till the very end. Sowmya, known for her inclusion of music in all her tellings, played a clinking tune with a pair of spanners and a hammer, while singing a soft ballad about his life. A brilliant rendition that humanized the railways for the audience. The final act was mine. I chose to tell the story of Martina, The Beautiful Cockroach, a Cuban folk-tale. I was scouring the internet for coffee-based stories when I found this. What a gem, this one turned out to be. I had to learn the Spanish accent to add authenticity to the story, so I had to listen to some Spanish speakers of English to understand the phonetics behind it. Penelope Cruz and Salma Hayek helped! As I was reading the story, I realized I was opening tabs to look up information on coffee, Spanish, Cuba and cockroaches. Did you know Cuban cockroaches (Panchlora nivea) are green? And did you know Kaldi, a goatherd from Ethiopia accidentally threw coffee beans in the fire only to realize that it gave out the most beautiful aroma, which in turn led him to make the first cuppa. And that to me, is the power of story. These are not topics I would look up on a normal day. I mean, I do love my coffee but to scout around for in-depth information on these matters is another issue altogether. One simple story has such far-reaching applications. You can get involved at any level you want. On the face of it, it might seem like a simple, funny, children’s story but can give rise to deep, enriching discussions about related topics. So powerful is the trigger. The reason I ended up reading about all these associated topics is because I was emotionally involved in the story. It made a connection with me. And real learning takes place only when a meaningful relationship has been established. It works the same way for everyone: children to adults. To be able to appreciate something, it must talk to you. Only a story can do that! The quantum of research we have all done to put together this one-hour show has been tremendous. In the bargain we have learnt so much more about this world, about the story behind things we take for granted, about the magnificence in the mundane. I assure you, once you’ve read about Martina, the roach, you’ll never look at those critters in your kitchen the same way again! This morning when I saw one in mine, I simply swept her out without hurting, while the words “Martina Josefina Catalina Cucaracha” rang in my head. From trains to coffee, from cockroaches to Cuba, this Tale Trail journey has begun on an excellent note and has set the tone for the New Year. The next session is on 25th Jan at the Rangasthala auditorium, Rangoli Boulevard, MG Road, 5 to 6pm. Do come over for an evening of stories about freedom and liberty. You never know what you’ll take back home!